color blending continues to be a mainstay in card making, and like everything else in the hobby, there's no such thing as too many inks and tools to get the perfect blend. 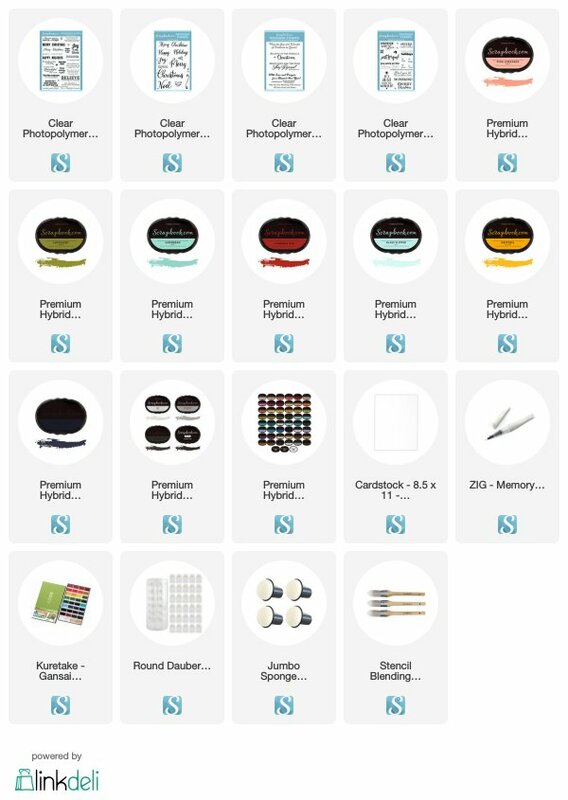 scrapbook.com is introducing a new line of premium hybrid ink pads and asked me to take them for a spin along with their new clear stackable daubers, jumbo sponge daubers, and stencil blending brushes. one of the coolest things about these inks is that they are organized in color families with four shades of a color to create the perfect ombre - and in addition to being able to purchase them individually, you can purchase them in color family kits. i was on a roll with christmas cards, so i decided to continue with my candy-colored christmas theme from my previous post using the same stamp sets and color pairings. first up, i created a few modern christmas trees by masking off three different sized triangles, blending pink lemonade, succulent, and caribbean inks into one triangle each using the clear stackable daubers. instant trees! the little daubers are the perfect size for small spaces like these and blended the ink on perfectly. and how great is the stacking storage feature? i topped the triangles with tiny star sequins and added clear wink of stella over them for added sparkle. to finish it off and give the look of snow, i splattered a shimmer watercolor paint over the entire card after stamping the sentiment. clean and graphic and so me! next, i created a simple merry christmas card starting with a masked off square, inking it in glass slippers ink. a little bit of detail is all you need here! this time, since my space was a little bigger, i opted to use the jumbo sponge dauber. the rounded edges are great for getting consistent blending and the size makes for quick work. after blending, i stamped a simple but cute merry christmas sentiment into the lower right corner and added a small sprig of holly for interest and additional color. i wanted something a little more than a one-layer card, so i cut it out and popped it up on a smaller 4-bar sized card base. not only clean and graphic, but clean and simple too - gotta love that! and last, but not least, i tried out the stencil blending brush on a similar shadow frame card, this time specifically creating a one layer design. i just love these brushes. they're so big and pretty for starters, but they are perfect for soft gradual blending. after masking off my detail square, i brushed ink in from the edges, leaving the center open for a star to coordinate with the sentiment. to highlight the star further, i used a small sponge dauber to get just the hint of a glow using the same color, kind of twisting it in place right over the star. then i colored the star with a wink of stella pen for added sparkle and shine. it's the litte details like this that make one layer cards work well. once again, the finished card is clean and graphic - my standard! and i learned that i need a few more stencil brushes so i can have one for every basic color family. today, i have a couple of fun new christmas cards to share with you using a selection of new and exclusive premium clear photopolymer holiday stamp sets from scrapbook.com. it's hard to believe that september is coming to an end - the time is now to start on a solid christmas card stash, right? so when they asked me to stamp and share, i couldn't resist! 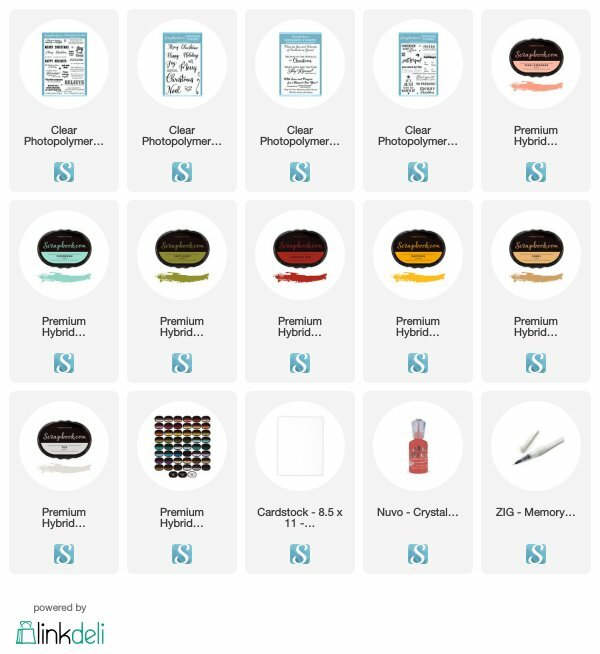 in addition to stamps, they are also introducing a new line of premium hybrid ink pads, which i will elaborate on in a different post, but since i'm using them here, i wanted to point that out, too. first up, i created a sweet believe card using a stamp from the set called holly jolly sentiments - clean and graphic, as is my favorite, but also with a fun technique. using a misti, i selectively inked and stamped the word believe in caribbean and pink lemonade inks, and then stamped the complete sentiment in succulent ink to finish it off. the misti or a similar stamp platform is especially helpful for equal spacing between words - you simply use the grid to measure how far to move the cardstock up or down to get the words in the perfect spot, while the stamp stays put on the lid. to emphasize the magic and add a little extra detail, i stamped the little reindeer in camel, colored him in, and added a touch of red nuvo drops for his nose. as you will soon see, i was totally in the mood for what i like to refer to as a "candy" christmas. while i love a traditional red and green, these lighter and brighter colors are my favorites and just make me smile! in fact, i decided to keep the candy christmas going with a second card, along with more selective inking. this time, only inking, not inking and repeating. i just love how this sentiment forms a little tree - so clever! with that in mind, i inked the words in succulent, the star in daffodil, and the heart in cardinal red, stamping each on it's own without moving the stamp or the card from the misti. the focal sentiments comes from gifting and tag chrismas, while the background sentiment comes from holly jolly sentiments. voila, perfect placement! although i love clean and graphic to the point of simple, the card seemed just a little too simple, so i added a merry christmas background in a light gray called fog for additional interest. it's almost tone on tone, which is perfect for letting the candy color scheme shine and it adds to the sentiment perfectly. this would be great for cash or a gift card - what my kids always ask for a lot of! i hope you've enjoyed this look at scrapbook.com's new line of stamps. some bigger sets, some smaller and so many great sentiments across the board. one can never have too many christmas stamps - they're magic and just what i want! !